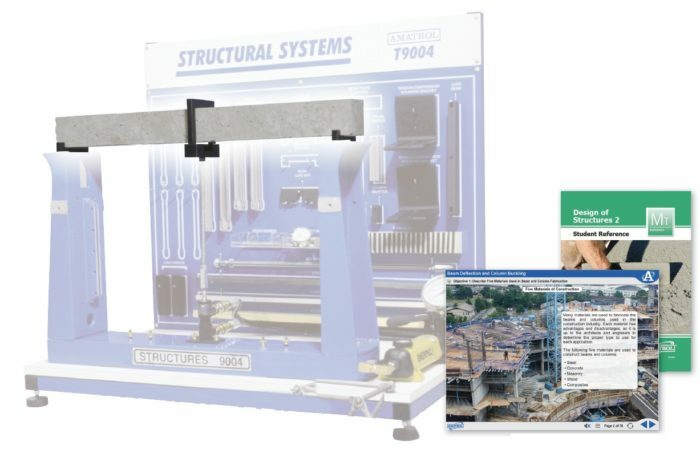 Amatrol’s Design of Structures 2 Learning System (94-DOS2) expands on 94-DOS1 concepts and covers topics like beam deflection, column buckling, concrete, building design, and construction. The 94-DOS2 introduces learners to theoretical principles such as how different types of loads affect a structure and then allows them build a scale model of a four story building frame and test how different stresses act on it. This marriage of theory and hands-on skills reinforce important structural design concepts and show learners how they apply to houses, office buildings, cathedrals, malls, and more. Among many other components, the 94-DOS2 includes a concrete beam component set that allows learners to mix and set their own concrete beams, then test them for weaknesses. Providing components that allow learners to build and test structural elements while working through the world-class curriculum is one reason that Amatrol is the world’s leader in skills-based, interactive technical learning. As an example of how Amatrol intertwines theory and hands-on skills to provide learners with a well-rounded learning experience, the 94-DOS2 thoroughly covers the concept of deflection. Deflection is defined as the displacement at a specific point due to a given load. The amount a beam deflects depends on the force applied to the beam and the beam’s size, shape, and material of construction. After studying the applicable laws, learners will practice calculating deflection and then measure beam deflection using steel and wood beams provided with the 94-DOS2. Design of Structures 2’s interactive multimedia curriculum covers a range of topics, such as beam deflection, column buckling, concrete, and building design and construction. Within this curriculum learners will study detailed topics like calculating the critical load for buckling, methods of delivering concrete to the jobsite, and environmental factors that affect building design. Amatrol’s peerless interactive multimedia curriculum utilizes text with voiceovers, pictures, videos, stunning 3D animations, and interactive quizzes and reviews that engage learners in theoretical knowledge and concepts. A sample copy of Design of Structure 2’s Student Reference Guide is included with the learning system. Sourced from the curriculum, the Student Reference Guide takes the entire series’ technical content contained in the learning objectives and combines them into one perfectly-bound book. If you would like to inquire about purchasing additional Student Reference Guides for your program, contact your local Amatrol Representative for more information.